I had heard of people using spray paint to simply spray paint the heads of the stakes, as well as people dipping them in paint cans. As well, I had heard of people using finger nail polish and painting the heads of the stakes, and then there were those that used Heat Shrink Tubing. So, at the time I didn’t want to find myself standing in the make-up aisle looking at finger nail polish, and I was not sure where to find the Heat Shrink Tubing, so I decided to paint them. At the time, spray paint seemed to be the most logical option considering cost and that it is simple to use. So I headed down to the local department store and picked up a can of Rust-Oleum in obnoxious yellow. Once that was done, I came home and laid the stakes out across a cardboard box and then taped them down on the sharp end. The tape was to hold them in place as well as to make a nice even paint line. But let me just say, in the end…it was not as I had imagined. The paint did not adhere to the stakes AT ALL. Numerous coats would have been required and that was something I didn’t want to do since I did not want to add a thick layer of paint that would be easy to peel off, and more importantly add a huge amount of weight to the light-weight stakes. So, I gave up. I grabbed some paint thinner and removed what paint did make it on the stakes. Then I put the stakes away and only pulled them out when I needed to use them with a tent/tarp. Since then I can happily say I have yet to lose the first one, but that doesn’t mean I haven’t spent time searching for them. So, the want to color the stakes have been there in the back of my mind, but I never really acted upon that thought again, until today. I decided to run by Lowes to see if they carried the little boxes of Heat Shrink Tubing like in Brian’s picture, but all they had was black tubing. No good. Then we headed to Wal-Mart. After walking around the hardware section I headed into the automotive section…and it was here that I saw the light! Right next to the wiring harnesses and the headlight bulbs were these little boxes, just like on Brian’s blog! I grabbed 3 of the boxes ($2.38/ea), but something else caught my eye to. It was some tail light tape. The tape came in red and yellow, so I grabbed some of the yellow. Once I got home I grabbed my tent stakes, some scissors and a hair dryer. Since each pack only had 5 small sections of tubing, each in a different diameter (1/8″, 3/16″ & 1/4″), I decided to cut the pieces in sections to make sure I had enough for all of my stakes. At first I cut one of the 1/8″ pieces in quarters. The 1/8″ pieces fit almost perfectly over the stakes without even heat shrinking them, however, these smaller diameter pieces were a little difficult to get around the bends. But, I shoved a piece on the stake and turned the hair dryer on…and nothing. The hair dryer did not even phase the tubing. 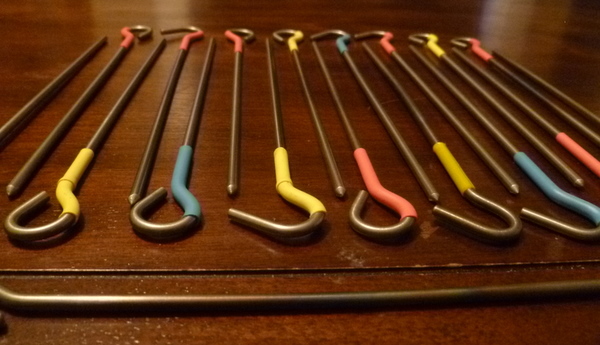 So, after outfitting all of my tent stakes with a bit of color I gotta say I am pretty happy with the end result. The best part of it all is that there was not even a weight difference as far as each stake was concerned, however, I have got to assume that when multiple stakes are together, there will probably be about a gram or 2 difference. But, I can live with that! I ended up cutting the pieces in half so that they were approximately 1.5″ long before shrinking, although even after shrinking there is not much of a noticeable difference. 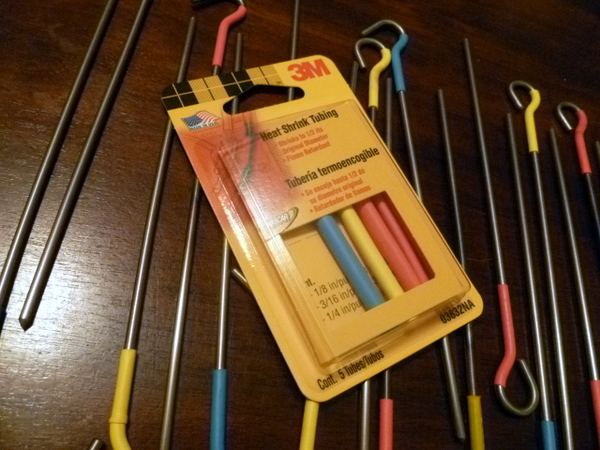 I also found that for my 3 mm diameter stakes, both the 1/8″ and the 3/16″ shrink tubing worked great. Like I mentioned earlier though, the 1/8″ is a bit harder to get around bends. As well, after both sizes have been shrunk down over the stake, they feel like they are there for the long haul. They will not slide around or move any at all. But, the great thing is that the tubing is not melted to the stake, so if I ever need to remove the tubing for one reason or another, it will be as simple as sliding a knife blade across it. And even better, I won’t have to worry about using paint thinner to remove paint! I have found that the yellow and the red stand out better than the blue and that the yellow stands out the best (in my opinion). Although, I will admit that none of them stand out quite like I had hoped. This may be partly due to the fact that I cut the pieces in half and that they would do better if they were left whole. I am not sure though. If I ever need to do it again though, I will do my best to find some bright yellow, preferably in the 3/16″ size. And if I could find it by the foot, that would be even better! Also, I did wrap some one of the stakes with the yellow tail light tape. It does not seem to be as bright as the Heat Shrink Tubing, but it is brighter than it was before. I feel like the tape will not last as long as the Heat Shrink Tubing though as I am afraid that the tape will eventually begin to peel away from itself. As well, I am curios as to whether or not the tape will leave that gooey residue once the tape has been on for a while and then removed. Only time will tell, but at this point, I like the Heat Shrink Tubing better. So, thanks for reading and watching. If you have any questions or comments please leave them below. As well, if you have a different method of coloring your stakes, please leave that info below too so that I (and others) can give these methods a try. And I also want to say thanks to Brian for his awesome blog, and for giving me something to do today!